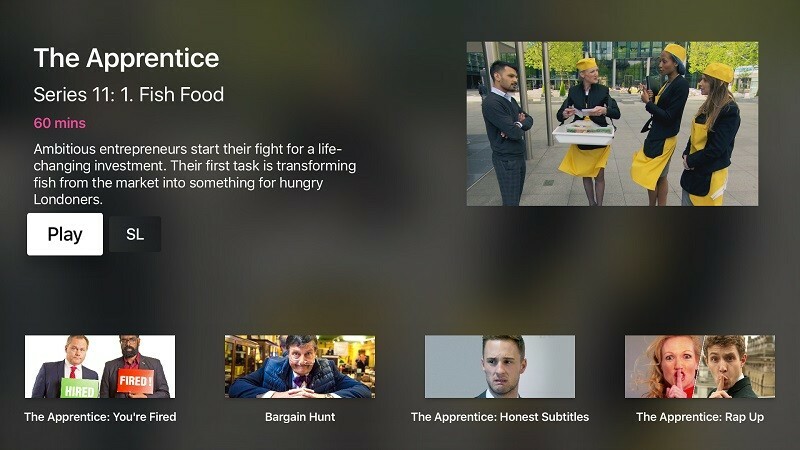 Following the unveiling of the new Apple TV back in September, United Kingdom-based public service broadcaster BBC told fans on Twitter that there were "no plans currently" to develop an iPlayer app for the new platform. While the broadcaster has backtracked slightly since that time, more recently stating it doesn't "have any info to give" on the topic, with the launch of the Apple TV right around the corner, a couple of Dorset-based developers have taken the task into their own hands to prove that the app can be made with relative ease. The BBC iPlayer app allows viewers of the popular British channel to catch up with current series and watch live TV on a smartphone or tablet. The company expanded support for the service to streaming devices like Chromecast and smart TVs last year, but never made the leap to Apple TV due to its limited SDK support and nonexistent functionality with other platforms like Android. Now, a pair of developers from Bournemouth, Dorset in the United Kingdom -- Matt Cheetham and Phillip Caudell -- have used a recent hack event to prove Apple TV support for BBC iPlayer could be implemented fairly easily by the broadcaster. The pair took to GitHub to share the app they created, dubbed the "Auntie Player," which splits the iPlayer experience up into Home, Categories, Live, and Search tabs, with full episode lists, descriptions, and run times for each show. Cheetham and Caudell cite BBC's "disappointing response" from September as the main source of inspiration for the proof of concept app, pointing out BBC's failure to support Apple TV as a direct contradiction to its public purpose to "make engaging digital content and services available on a wide range of digital platforms and devices." Most impressively, the duo planned, coded, and completed the app in under nine hours at the "Hack to the Future" event in Bournemouth over the weekend. As they note in the GitHub post, the two won't be submitting the app to the App Store, but they wanted to showcase "what can be achieved with the tvOS platform and the BBC's amazing content." The app we're publishing here was built in just under 9 hours at a hack event to prove it could be done. It's by no means complete or perfect, and it's very much a proof of concept. It's our hope the BBC will release an official app for Apple TV, as they've made iPlayer available on a wide range of other set-top boxes and Smart TVs. Check out the developers' full suite of source code for Auntie Player on GitHub, along with an array of screenshots and more of the reasoning behind sharing their creation with the public. With Apple's new tvOS developer tools for the fourth-generation Apple TV, the platform is now open to all developers, significantly broadening the potential for Apple's set-top box beyond the locked-down content provider model that has existed until now. Just yesterday, Apple CEO Tim Cook reiterated his thoughts that the television experience needs to be reinvented and that apps are the way to do it. I won't be getting the new ATV until all the catch up services are available. It's a minimum requirement in the UK. I understand that the British pay for the BBC through their television tax, and do not expect that they would give their American cousins access to iPlayer without charge, but surely there must be some way to make it a pay service. I would love greater access to British television. Why don't these guys polish it up and then sell to the BBC? One thing I noticed is the speed of playback... I wonder if that was edited or really fast due to some other reasons? That seemed impressive. Hey, one of the developers here. No editing: it really is that fast! The stream will start off low quality and quickly ramp up to full 1080 quality. We've also skipped out the idents which the website adds at the start of each video, which slows things down. Wait, these Brits literally have to pay a TV tax. They should be able to watch programming on every and any device they want. I can't see any logical reason why BBC would NOT be developing an app. Better a "TV tax" as you put it than the rubbish that passes for broadcast TV in the states. At least our broadcast TV is thoroughly excellent, and on the BBC without ads in addition. To put it in perspective, because everyone (almost) pays the BBC subscription it only costs about £12 per month. Sky on the other hand, that produces virtually no original programming, is typically in the region of £30+ per month. I know which model I prefer! No, the BBC stated that they would not put an Iplayer app on the Apple TV because to quote..
"One of the reasons we decided to support Chromecast was that Apple TV currently works only with Apple devices. Chromecast has SDKs available for a number of different platforms including iOS, Android, and the Chrome browser for laptop and desktop computers"
Which is a VERY poor excuse given that they've put iplayer on every home console and streaming box for years. How the PlayStation 4 iplayer app serves anything other PlayStation 4 owners etc in a way that the Apple TV doesn't serve Apple TV users is beyond me. Sales? Interesting point.. Or at least it would be if the BBC hadn't already given the go ahead for an Nvidia Shield Iplayer app before the box had even been released here. Sales of Apple TV can't be doing too badly either for Amazon to feel the need to ban the sales of them (and Chromecast) to better push their own Fire Tv boxes in the market instead. So no, sales is probably not the answer here either. I see that the BBC has today announced on their website that they will be developing an app for the new Apple TV. They cite Auntie Player and this Mac rumors thread too. I also enjoy the differences in language such as "colour" vs "color" or "boot" vs "trunk" :D.
Mate. This is a proof of concept hack. Chromecast is far more popular than ATV, smart move. It's not about developing, it's about supporting going forward. Also without knowing the backend of iplayer, please don't assume this is comparatively little work. It's a proof of concept hack that took 9 hours to do with no inside knowledge of the iPlayer backend or the BBC's systems. Of course it's comparatively little work. All they need is the UI. They already have a system in place for delivering streams and downloads to a range of different devices and the (new) Apple TV runs iOS and has the same hardware as a platform that they already support. You're trying to invent problems that don't exist here to disprove my point. They have a team that supports iOS, it is no stretch to also support the Apple TV, which is an iOS device. The Apple TV supports all of the resolutions and formats that the BBC already deliver to the devices they already support. Their stated mission is to ensure that digital content is available to as wide a range of people in the UK as possible. There's no technical reason they can't support the new Apple TV. Agreed. Without such apps there's little reason to get the new Apple TV instead of using the old one for iTunes and the PS4 for everything else. The TVCatchup app would be fantastic (that's an app that streams terrestrial digital channels live)! Actually TV licence is optional and we only need to pay if we're watching live TV - so we can watch catchup without paying, but iPlayer offer an app for many Smart TV's so I doubt they won't release one for Apple TV - I would imagine half the code base required is already in the iOS app.